In today's world, everybody is worried about how they look. However, looking great doesn't have to take too much time or effort. All you have to do is know what you're doing. Here's how to get your routine down pat! Analyze your skin to see what type of skin you have: oily, combination, normal, dry, etc. Many cosmetic counters have someone there that can do a preliminary analysis of your skin, and recommend some products. If you are on a budget, see what the professional at the cosmetic counter recommends, then go to your local drug store and find a similar product for way less money! Start with a freshly-washed face (and hands, too). Get a facial, or do one yourself. You want your face to be a clear and smooth canvas for you, the "artist," to do your art. Use a good deep-cleansing mask. Do not exfoliate if you have oily or sensitive skin. It will spread bacteria around your face from the already existing blemishes. Use antibacterial soap if you have acne. Also be sure that you replace the towel you use to dry your face every week. Lastly, apply toner by taking a cotton pad that has been dampened in warm water and sweep it over your face. Toner will restore the pH level of your skin and pick up any remaining dirt. Massage a light moisturizer into your face no matter what type skin you have, avoiding the eye area! This will help oily skin dry, and dry skin become smoother. Wait a few minutes for it to soak into your skin. After letting it sit for a while, rinse face with warm water, and pat dry. Apply a sheer foundation that matches your skin tone. To find the right one, go to the makeup counter at a local department store and have the artist there help you. Wear illuminator to make your skin appear youthful and dewy compared with dull, matte makeup. Skin illuminators come in powder, cream, mousse, etc. L'Oréal, Revlon, Neutrogena, and other brands make them - it's like make up with tiny particles that reflect light. Use a makeup sponge or wedge, starting around the hairline and working your way down. (Use the wedge for this routine because you can be more precise about where the make up goes.) If you want a proper look that looks as if it has been done by a professional makeup artist, try using a foundation brush. Remember to apply the makeup all the way down to your throat area and keep blending so you can't see where the make up ends. Nothing is worse than looking like you have a mask on your face! Around the eye area, do very light strokes inward, toward the inner corner of your eye. Don't apply it to your upper eyelid! All of the professional makeup artists say not to apply foundation to this area. This is why you need a foundation that matches your skin. If you want foundation to darken your skin then try putting it above your eyes, and see what you like. Be gentle with this part, because the skin is very delicate and sensitive here. Apply concealer to any red or discolored spots. In the corners of your eyes, where it's blue, and around the nostrils are good places for this. Do this after applying foundation, so you don't use too much (many makeup artists do this the other way around). First apply the concealer, then pat very lightly with your finger to blend. Only apply concealer to the area that you want to conceal. Afterwards, use the wedge to blend the concealer in with the foundation. Stand back away from your mirror to see if you have effectively concealed the areas. Try to stand about the distance away from the mirror that you stand away from people when you talk to them. Another way to conceal blemishes is to pat green concealer on the blemishes and red spots, then put foundation over top (the green reduces redness). Apply a loose powder all over the face using a powder brush. Pat it into the powder; then, with a paper towel, tap the brush so the excess falls off the brush. Lightly brush across the whole face. 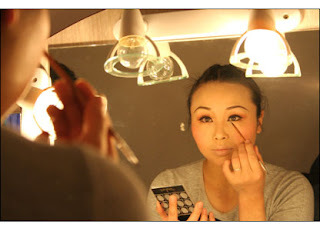 Use a powder puff (small) to apply powder on the upper lid. Apply a bronzer to your forehead, cheeks, and chin, to give a sun-kissed look,if wanted. Highlight your brow bone and cheek bones by applying a light powder just below the brow, and to the highest part of your cheek. Apply a small amount of blush to the apples of your cheeks. Smile so you can see the apple of your cheek. Start the application at the apple and drag the blush outward toward your temple, following your cheek bone. Blend the color down a bit below your cheekbone in towards your earlobe. If you added too much color to the brush, use the clear side of your wedge to blend it in more until the color is faded out a bit. Your cheeks should have a hint of color. You don't want to look like a clown! 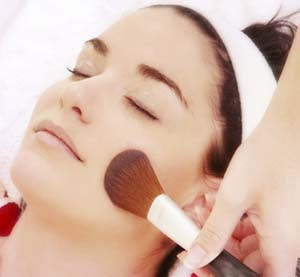 Take a fluffy powder brush and blend everything together, so that there are no visible lines or excess powders. Line your eyes. Lightly pull one closed eyelid straight to the side and line it with a brown or soft black liner. For a more appealing look, apply liner with very light strokes to the upper lid, stroking toward the outer corner of the eye. To blend, use an angle brush. For a more natural look, dip the angle brush in some of your darker eyeshadow. Use a very light amount, or use the applicator tip. For the bottom lid, use a very light amount on the outer corner. apply right on the brow bone just under the brow line. Make sure to use the larger eyeshadow brush to blend all the colors. Use eyebrow pencil color that is very close to your natural eyebrow color. Here you just want to fill in missing areas. (It might behoove you to visit a makeup person that can arch your eyebrows correctly. If you've never done it yourself, have someone do it for you.) Your eyebrow should look very natural. If you do apply eyebrow pencil to any part of your eyebrow, use the angled brush to blend it into your brow with very light strokes. Use a lash curler first before applying any mascara. There are several mascaras to choose from depending on the look you want. If you have short lashes, use a mascara that will add length... if you have thin lashes, use a volumizing mascara. Never pump your mascara brush in and out of the mascara. This causes air pockets. Dip the brush in the mascara once and lightly wipe off the excess onto a paper towel. Looking downward, apply to the top lash with upward strokes. Start with the inner part and work your way outward. Do both eyes with two coats, then let dry. After a few seconds, do the bottom lids. It's better to apply to the very outer part of the lash on the bottom lid. This will open your eye more. An inexpensive way to curl your eye lashes is to take the brush from an older mascara, and use it , after you've washed MOST of the mascara off. Line your lips with a liner that matches your lip color. Make sure your lip liner pencil is sharpened, but not too sharp. Line around the natural line of your lips. Trying to create a fuller lip by dragging the lip pencil outside your lip line is for professionals. Usually it makes you look like you're just plain bad at applying makeup! After applying your lip pencil to your lip line, rub your lips together so the lip pencil color spreads inside your lips. Apply lipstick or lip gloss with a brush. It will spread it evenly. It's a good idea to brush your lip brush in your lipstick, then some of your lip gloss for a nice light shine. Blot your freshly painted lips lightly with a tissue. Use a pressed powder to lightly powder the rest of your face, and the area under your eyes. Use very light pressure. Keep your pressed powder in your purse for touch ups.